I scoured the internet looking for inspiration. My oldest daughter is a ballerina and loves all things “fancy” so when I showed her some tutu versions of Alice, she was all about it. I bought the tulle and she helped me loop it around the elastic. For Alice, I made a half-apron for the top and just used white tulle in the front skirt rather than making a whole. I made the Alice skirt nice and long and elegant to match my older daughter’s personality. I added an cleaned out medicine bottle with a “Drink Me” tag and a fun little prop and added a little black bow to a headband to finish off the look. For the Queen I looped lots of short pieces of tulle to make it a little stiffer and stand out instead of hanging long like Alice’s. I dug through a box of hand me downs and found the perfect lacey onsie for her costume. I added felt hearts to the onsie, a paper crown attached to a headband, and a felt heart wand. It was a little chilly, and her ruffly black sweater went perfectly with the costume! In the movie, when Alice and the Queen are together they are playing croquet with flamingos. So I HAD to hunt down some pink flamingo lawn ornaments. I ditched the legs, cut a hole in the top of each one, and stapled knotted pink satiny rope inside to make their trick or treat buckets. The girls had a ball! 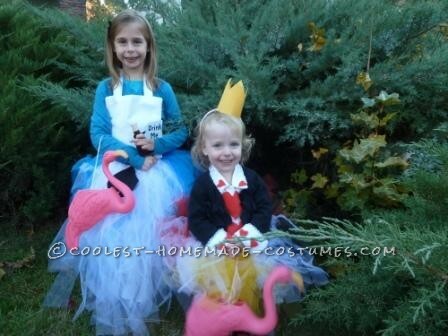 They loved their flamingos, and the skirts are now a part of the regular dress up rotation. In fact, they were dancing around the living room in their skirts again today. I had so much fun making these! And the girls had a blast on Halloween! The costumes are now a part of the “dress up clothes” rotation and get worn more than any other costume or dress in the bin! So very clever. I like the way you thought through all the pieces of these costumes. very clever, creative and affordable!! and that they can be reused… a bonus! !